© Andrew Harnik/AP Photo President Donald Trump and first lady Melania Trump board Air Force One at Joint Base Pearl Harbor Hickam, Hawaii, Saturday, Nov. 4, 2017, to travel to Yokota Air Base in Fussa, Japan. Trump begins a five country trip through Asia traveling to Japan, South Korea, China, Vietnam and the Philippians. 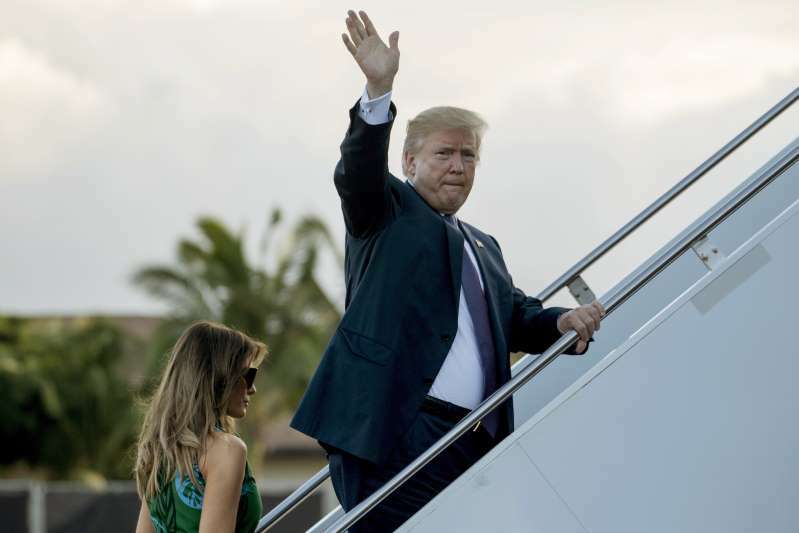 President Donald Trump has canceled a visit to Colombia that he had planned for early December, a U.S. official said on Friday. Trump had planned the visit to take place after his attendance late this month at a G-20 summit in Bueno Aires, Argentina, where his stay is to include a meeting over dinner with Chinese President Xi Jinping. No immediate explanation was given for the cancellation of the Bogota visit. It is the second time this year that Trump has skipped a planned trip to Bogota. He had been scheduled to visit the Colombia capital in April after attending the Summit of the Americas in Lima, Peru, but stayed in Washington to focus on responding to a chemical weapons attack in Syria. Trump met with Colombian President Ivan Duque on the sidelines of the U.N. General Assembly on Sept. 25, the White House said.